Have you joined in the 'FLOWER' challenge at Uniko yet? We are still celebrating Bev's Birthday so get those floral stamps and out and create! I am here to remind to that the challenge is still open for one week. I simply stamped the flowers on card and die cut. I do love the bright a cheerful look. We are joined this week by Jane and Carol, both fabulous Guest Designers-check out their cards and the DT cards here then get those flower stamps out and ink away! Don't forget you can use any stamps you like, no need to only use Uniko stamps. Brilliant! Love those funky floral letters! LOVE this immensely, Sandie...and now I *need* that love die! Gorgeous! I've thoroughly enjoyed being a co-GD for this challenge; the opportunity to play alongside you and the rest of the team is such an honour! Oh wow! Love the fresh, zingy colours - so perfectly clean and simple too! Love, love, love your card. A beautiful, joyful and sparkling with wonderful energy. Brilliant idea. 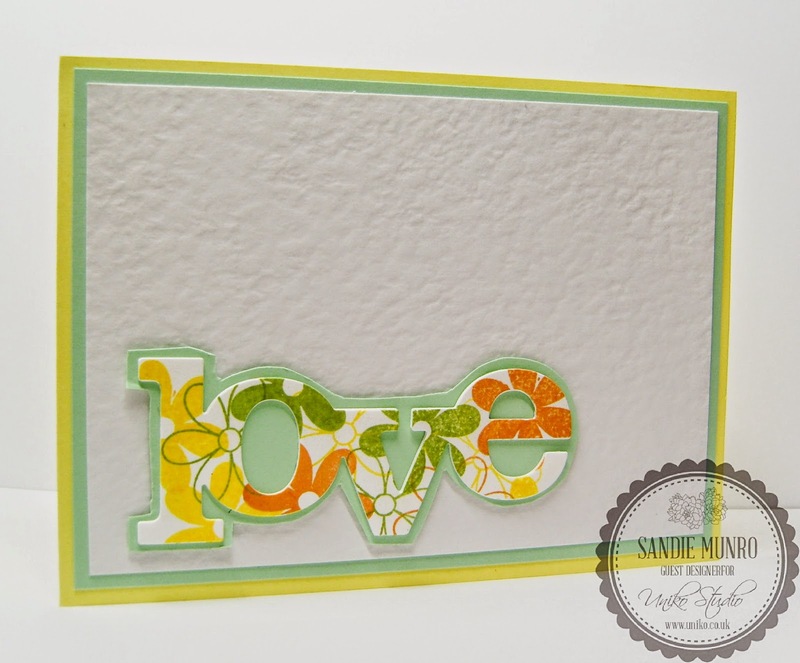 Love how you stamped before die cutting. Love seeing same diecut, totally different card. Fresh and funky. Note for self: must use DPs for my die cut sentiments. This looks beautiful and very different from the purple version in your newer post. Love this so much!! Such a cool idea to stamp all those little flowers and then die-cut. And really like the layering of CS under the 'hello'. Brilliant!